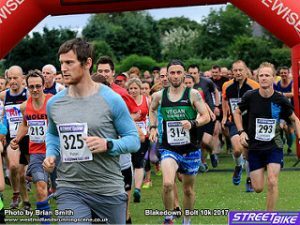 The 11th Blakedown Bolt 10km was a blast! The weather was warm, but not too warm for the runners, and this year we saw some very fast completion times. We trialled chip timing this year, and were delighted with how it worked. A lot less stress all round, and many runners told us how pleased they were to be able to get their individual results within moments of finishing. Have a look at the full results. Many thanks to Brian Smith who attended the event to take photos of our runners – check out the full gallery on Brian’s Flickr site. And huge thanks to everyone from Churchill, Blakedown and further afield who helped us on the day – this is a true community event and we couldn’t do it without the support of a large group of enthusiast locals. The Churchill & Blakedown Short Mat bowling Club. We usually support organisations with a sporting- or health-related aim, and we like to keep our support fairly local. Download a Bolt Grant Form if you know of an organisation that could benefit. This year we made a profit of almost £2,500 on the race itself, and the Churchill & Blakedown Sports Committee made a separate profit of more than £2,000 on the bar and BBQ! Not a bad effort for a summer’s evening!